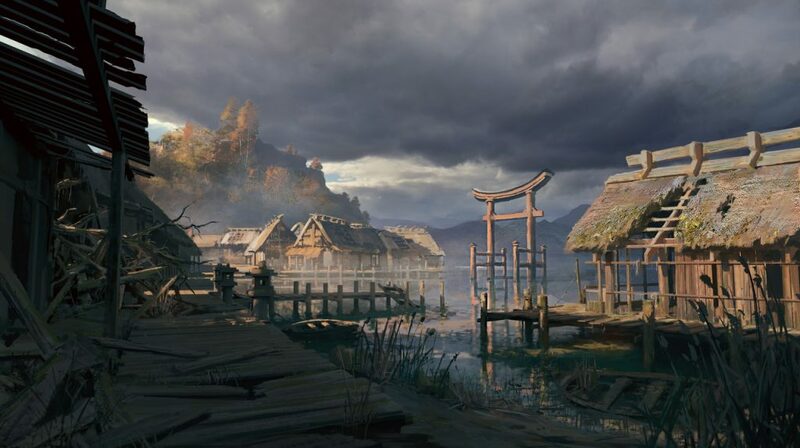 For the sixth ArtStation Community Challenge, participants from the Environment Design category were tasked with creating two environments that fit within the theme of Feudal Japan (1185-1603). For each environment design, they also needed to produce a callout sheet that contains the elements that make up the final rendered environment, as if they were going to be used in a real production pipeline. Submissions were not judged only based on their narrative aspects, creativity, design and composition but also on how well they were able to develop each element in keeping with the historical theme. 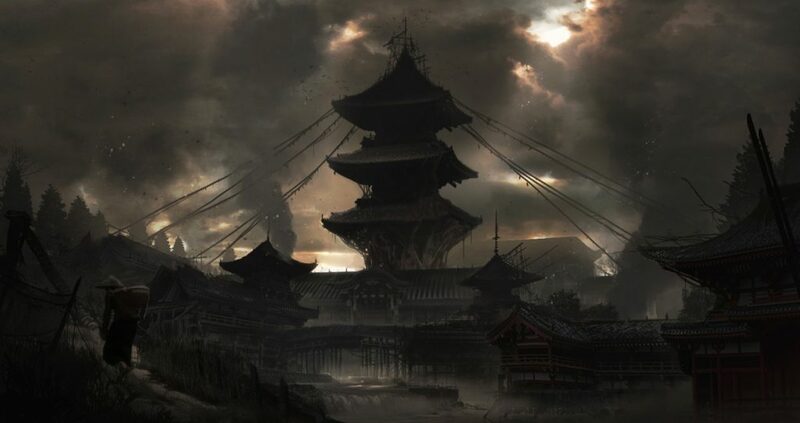 Browse all Environment Design entries from the Feudal Japan Challenge. In this interview, the winners David Honz, Alessandro Paviolo, and Ivan Ilko discuss their strategies, inspirations and advice for future challenges. Tell us about how you got your ideas and inspiration behind the environment you created. David: I had some basic ideas about the mood and the overall direction right at the start of the project, but it was the research and inspiration I gained through it that gave it sort of a body. To be more specific, in this particular project I knew I wanted to do something mysterious and spiritual that was a little grim maybe. 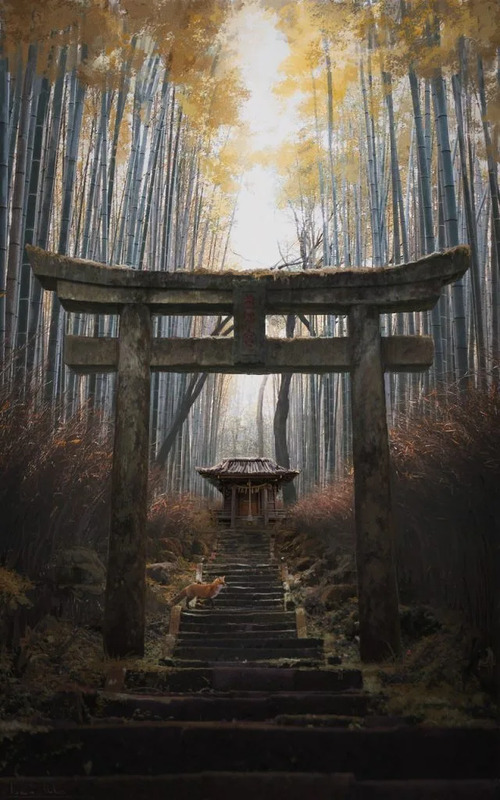 So I started to study Japanese mythology, religions, and traditions present in Feudal Japan. It was then when specific ideas started to pop out. The Omagatoki, the Zen gardens, temple, lake island. Some things I read about just started to resonate with what I wanted to achieve and connecting all or most of them was so much fun. 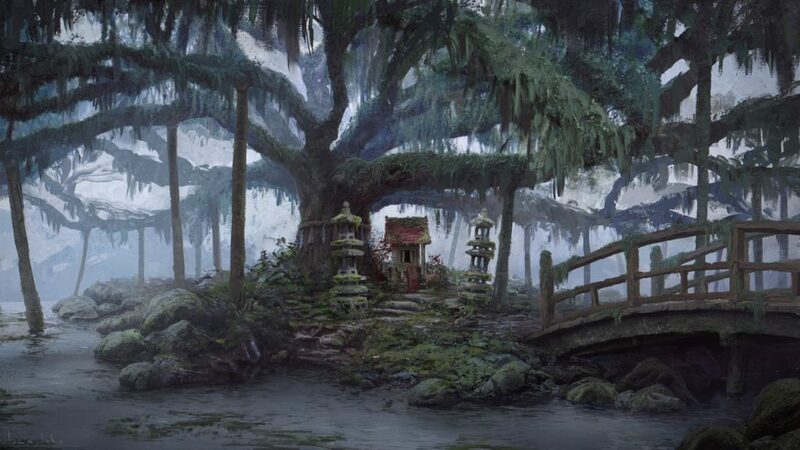 Alessandro: I tried to create a location that could have been used in a video game, dividing the two illustrations in an exterior concept, to describe the general setting, and an interior, where there could have been a boss fight arena. I wanted to narrate a story set in the Feudal Japan period not about heroes but about poverty and loneliness. Ivan: My main inspiration comes from old Japanese legends and style. Before doing any sketches, I went to the library and made a research in Japanese traditional architecture and style. I wasn’t sure exactly what I wanted so I started researching everything I could find. Then I started reading old Japanese legends to get my inspiration. 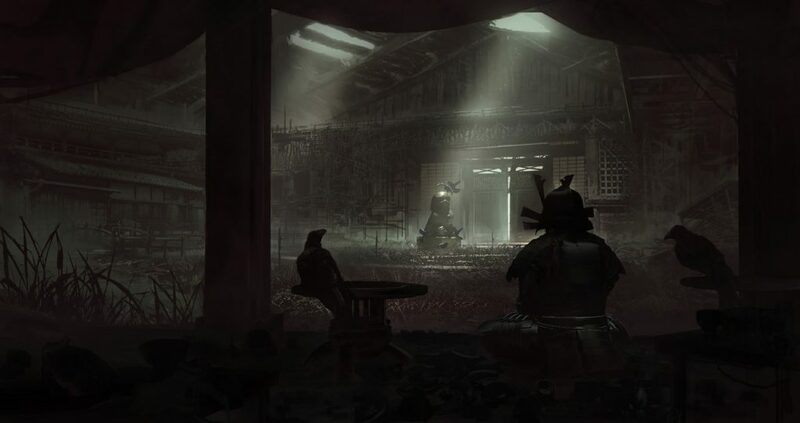 I really wanted to create something more deep and different from how people usually perceive iconic Feudal Japan. David: I know I tend to spend a lot of time in the beginning phase. There are always tons of arguments going on in my head before I feel that the sketch is the right one. So, my only strategy for this competition was to give myself enough space right at the start to be sure that I have a deep connection to what I’m making and then just keep working on it as regularly as I can. Alessandro: The first thing I decided to do after I collected some references was to immediately throw myself into the development of grayscale sketches. These fast concepts were the one that pushed me in doing the next steps with more energy and enthusiasm. From there I planned with deadlines for each step, checking it everyday to see if I was ahead or behind. Ivan: I know many artist try to find the image they want by doing many sketches and then picking from them but this approach doesn’t work that well for me. What I do instead is I start with research and then take a break for few days to develop ideas in my head so by the time I start sketching, I already know more or less what I want and how to achieve it. David: The most difficult part was definitely making the callouts. The problem was that due to my not so great time-management strategy and checking and rechecking everything in the scenes, I had very little time to make the callout sheets, which is something I have to plan a bit better in the future. Alessandro: Being coherent with the theme was for sure the part I struggled with the most. I found some references I really liked that were pushing me to a more fantasy direction instead of keeping the Feudal Japan setting that was requested. 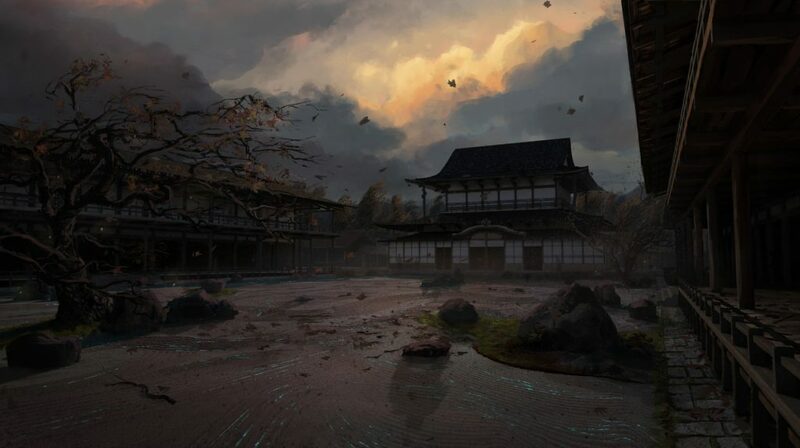 Ivan: Trying to avoid overused iconic forms in Feudal Japan while still making it believable and fit the setting was the most difficult part. David: I’d say spend as much time as you can on the research, don’t be satisfied with a general knowledge of things and go as deep as you can. I think the best way is to read and study about the subject and then, if it is possible for you, go to visit and study the place you want to get the inspiration from. This way you will get the most authentic, believable and honest result you can. Also, in my opinion, you will enjoy the creation process even more. Alessandro: Keep yourself motivated! Some evenings I would have preferred to play video games or just relax instead of continuing the challenge but going forward was the best choice. Of course, I spent a couple of nights awake but the experience gained after finishing the challenge has certainly made it worth it! Ivan: Gather your references, they are extremely important. And by references, I mean not only visual material. Read stories, legends, novels and let your imagination build the image for you.